While the fall weather tempts you to curl up on the couch or in front of a fireplace, the reality is that this season is busier than ever. Between after-school activities and gearing up for the holidays, families don't have a ton of time to create delicious meals—but that doesn't mean your weekly menus have to skimp. We rounded up some of the tastiest recipes that are ideal for chillier nights. The best part? You can prep them in 20 minutes or less so you have more time to spend on what really matters. 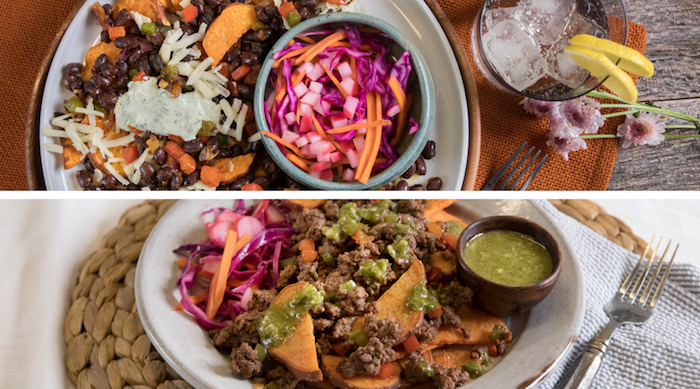 When it's too chilly to cook on the grill outside, opt for this meal indoors. Wash and dry all produce. Bring a large pot of salted water to a boil. Place chicken on a cutting board and cover with plastic wrap. Pound with a mallet, rolling pin, or heavy-bottomed pan until ½ inch thick. Heat a drizzle of oil in a large pan over medium-high heat. Season chicken all over with salt and pepper. Add to pan and cook until no longer pink in center, 3-4 minutes per side. Remove pan from heat. Meanwhile, finely mince chives until you have 1 TBSP. Mince chili, removing ribs and seeds first for less heat. Once water is boiling, add 4 oz gemelli (about ⅔ of the package) to pot and cook, stirring occasionally. After about 5 minutes, add green beans to same pot and continue cooking until tender, about 4 minutes more. Add cheddar, cream cheese, minced chives, 1 TBSP water, 1 TBSP butter, and a pinch of chili (to taste) to pot with gemelli. Stir until a thick and creamy sauce forms. Season with salt and pepper. Add barbecue sauce, vinegar, and as much remaining chili as you like to pan with chicken. Return to stove over low heat and toss until chicken is coated in a sticky sauce. 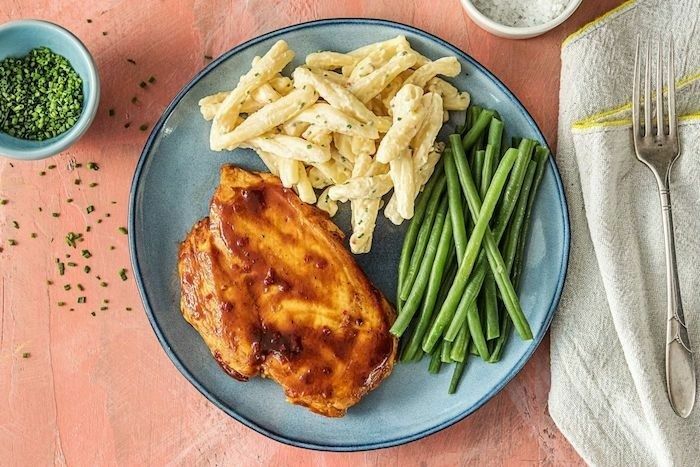 Divide between plates and serve with mac 'n' cheese and green beans on the side. Sweater weather calls for carb-loading. This one will have some yummy leftovers. 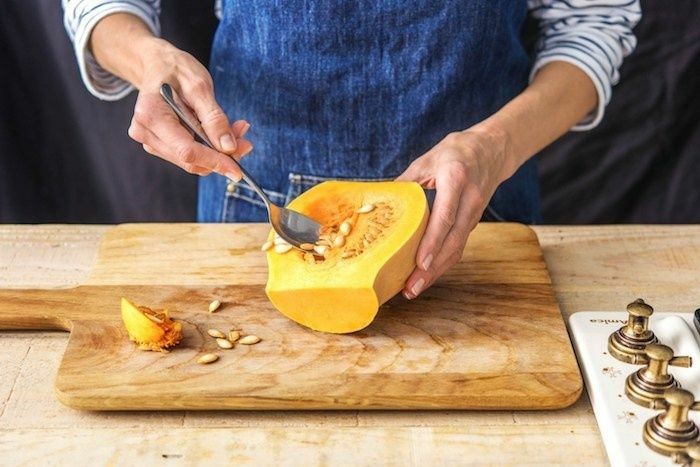 Using a Microplane grater, completely remove the zest from the lemon, leaving no patchy parts, and transfer the zest to a bowl. Cover with plastic wrap and reserve. Trim and discard the ends from the lemon then chop into rough 1/2-inch pieces, discarding any seeds. Heat 2 tablespoons olive oil in a large skillet over medium-high heat. Add the chopped lemon, season with salt and pepper, and cook, stirring occasionally, until the lemon is caramelized in spots and the pith is tender, 6 to 8 . minutes. Transfer the lemon pieces to a bowl. Wipe out the skillet with a paper towel and return it to the heat. Heat 3 tablespoons olive oil in the skillet then add the mushrooms, thyme, and garlic, and cook, stirring occasionally, until the mushrooms are golden brown and starting to fry in the oil, about 16 to 20 minutes. Meanwhile, bring a large pot of salted water to a boil. Add the pasta and cook until al dente, 7 to 10 minutes, according to package instructions. Drain the pasta, reserving 1 cup of the pasta water. Add the cooked pasta and 1/2 cup reserved water, the reserved lemon zest, and the chile flakes to the skillet with the mushrooms, and cook, tossing, until everything is combined and warmed through, adding up to 4 tablespoons more pasta water to keep everything well-moistened. Season the pasta with salt and pepper and serve while hot, sprinkled with parmesan on top, if you like. Recipe from Tasty Ultimate: How to Cook Basically Anything. The apple salsa adds the perfect finishing touch. In a small bowl, combine the apple, lemon juice, honey, onion, and salt. Set aside. In a large skillet over medium heat, melt a little butter. Put 1 tortilla in the hot pan and sprinkle it evenly with chicken, cheese, and spinach. Put the remaining tortilla on top. Cook until the cheese just begins to melt and the bottom of the tortilla is golden, 2 to 3 minutes. Using a broad metal or plastic spatula, carefully flip the quesadilla over and cook until the cheese is completely melted and the tortilla is golden, another 2 to 3 minutes. Remove the quesadilla from the pan and allow to cool for 2 minutes. Cut into wedges and serve with the apple salsa. Recipe from Cooking From Scratch. *(c)2018 By PCC Community Markets. All rights reserved. Excerpted from Cooking from Scratch by permission of Sasquatch Books. These make a delicious salad on their own, or as a side to an entree. Cook bacon and pecans. Medium dice bacon into about 1/2 inch pieces. Place bacon in a dry medium sauté pan over medium heat. Cook 2 minutes, stirring occasionally. Add pecan, cook 8-10 minutes, or until pecans are toasted and bacon is crispy, stirring occasionally. Transfer bacon and pecans to a paper towel (keep bacon fat in pan). Start brussels sprouts. Return pan with bacon fat to stovetop over medium heat. Add brussels sprouts and shallot to hot pan. Season with salt and pepper. Cook 7-10 minutes, or until veggies are crisp-tender, stirring occasionally. Finish brussels sprouts. Add about 1/2 cup water to pan with brussels sprouts. Stir. Cook 2-3 minutes, or until water or until water cooks off and veggies are tender, stirring occasionally. Remove from heart. Return bacon and pecans to pan. Salt and pepper to taste. Stire to combine. The prep for this only takes 20 minutes, and then you can let the slow cooker do the rest of the work! Spray a 7- or 8-quart slow cooker with a nonstick cooking spray. Add all ingredients except heavy cream into slow cooker. Cook on low heat setting 7-8 hours or high heat setting 4-5 hours. Stir in heavy cream and adjust seasoning to taste. Garnish with extra heavy cream and herbs. 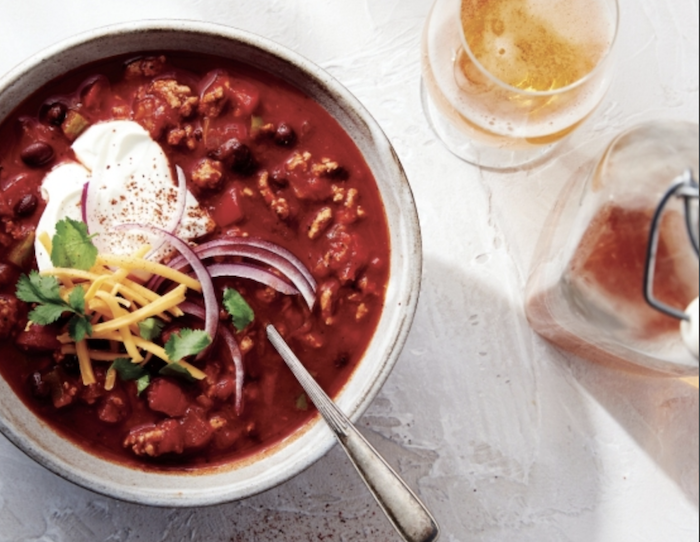 Chili in the fall? Groundbreaking... but it's just too good to pass up. Spray a large, heavy-bottomed soup pot with cooking spray and put over medium heat. Add the turkey and cook, stirring occasionally to prevent sticking and to break up the meat into smaller pieces, about 5 minutes. Once the turkey is no longer pink, drain off and discard all the liquids. Stir in the onion, bell peppers, garlic, chili powder, black pepper, chipotle, cumin, thyme, and salt. Cook, stirring occasionally, for 3 minutes, until the onions are translucent and the spices are deeply colored and fragrant. Add the tomatoes and tomato sauce, then stir in the water. Bring to a simmer, cover, and cook for 20 to 30 minutes, until the vegetables have slightly softened and flavors have melded. Stir in the beans and sugar, heat through, and serve. Apple and maple syrup... what more could we want in the fall? Wash and dry all produce. Trim, then thinly slice scallions, keeping greens and whites separate. Pick and finely chop enough rosemary leaves from stems to give you 1 tsp. Halve, core, and dice apple. Heat 1 TBSP olive oil in a small pot over medium-high heat. Add scallion whites and ½ tsp chopped rosemary. Cook until fragrant, about 30 seconds. Pour in ¾ cup water. Bring to a boil, then immediately stir in couscous and a large pinch of salt and pepper. Remove from heat, cover, and let stand until tender, about 10 minutes. Meanwhile, pat pork dry with a paper towel. Season generously all over with salt and pepper. Melt 1 TBSP butter in a large pan over high heat. Add pork and cook until browned and cooked through, about 2 minutes per side. Remove from pan and set aside on a plate. Reduce heat under pan to medium. Stir in remaining chopped rosemary, 1 TBSP vinegar (we'll use more later), maple syrup, stock concentrate, and ¼ cup water. Let simmer until thickened, about 1 minute. Stir in 1 TBSP butter, then season with salt and pepper. Return pork to pan, tossing to coat in sauce, then remove pan from heat. Whisk together mayonnaise and remaining vinegar in a medium bowl. Add lettuce and apple. Toss to combine. Season with salt and pepper. Fluff couscous with a fork, then divide between plates. 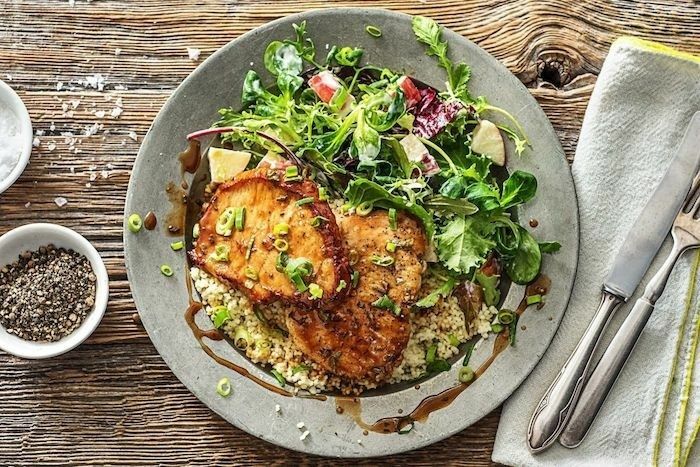 Arrange pork on top of couscous and drizzle with any sauce in pan. Garnish with scallion greens. Serve with salad on the side. When you want to cozy up with pizza, make this flatbread. Adjust broiler rack so that it is in position closest to flame and place a baking sheet on rack. Preheat broiler to high. Rinse chicken, then pat dry with a paper towel. Season all over with salt and Tuscan heat spice. Heat a large drizzle of olive oil in a large pan over medium-high heat (use a nonstick pan if you have one). Add chicken and cook until browned and no longer pink in center, about 2 minutes per side. Remove from pan and let cool slightly, then cut into bite-size pieces. Wash and dry all produce. Cut any large broccoli florets into bite-size pieces. Core, seed, and dice tomato. Heat a drizzle of olive oil in same pan over medium-high heat. Add broccoli and tomato. Cook, stirring, until just tender and wilted, about 3 minutes. Season with salt and pepper. 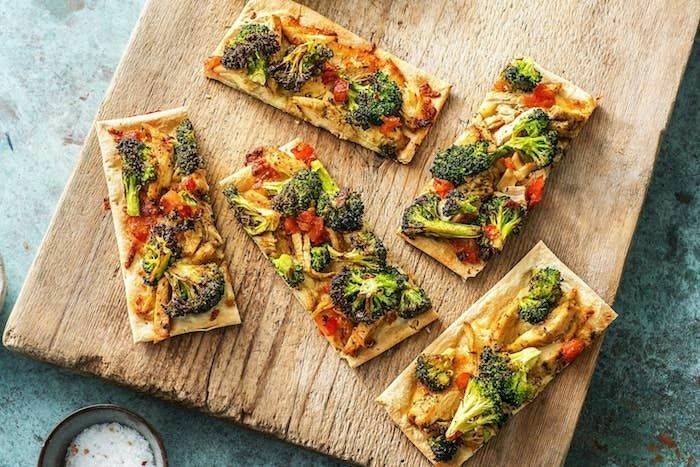 Scatter mozzarella in an even layer over flatbreads, followed by chicken, broccoli, and tomato. Carefully remove baking sheet from broiler and sprinkle with a drizzle of olive oil. Place flatbreads on sheet and sprinkle each with a drizzle of olive oil. Carefully return sheet to broiler and broil flatbreads until cheese melts and crust starts to brown, 3-4 minutes. TIP: Check flatbreads occasionally for any burning. Remove flatbreads from broiler. Sprinkle with another drizzle of olive oil and season with salt, if desired. Let flatbreads rest for 1 minute, then cut into slices and serve. Whether you're hosting people over for game day or want a healthier snack, these look incredible. Chef's Tip: Cut the sweet potato as thin as you like. The thinner the slice the crispier the chip. Spread sweet potato out in a single layer on a lightly oiled foil-lined baking sheet (see Chef's Tip). Roast 15-20 minutes, or until chips are lightly browned and slightly crisp, flipping halfway through. Heads Up: Two baking sheets may be needed to fit all the chips in a single layer. Add ground beef to pan with veggies. Stir to break up beef. Sprinkle with desired amount of chorizo-style seasoning. Stir to evenly distribute seasoning. Cook 6-8 minutes, or until beef is fully cooked, stirring occasionally. Salt and pepper to taste. Stir. Take Note: Ground beef is fully cooked when it's no longer pink. 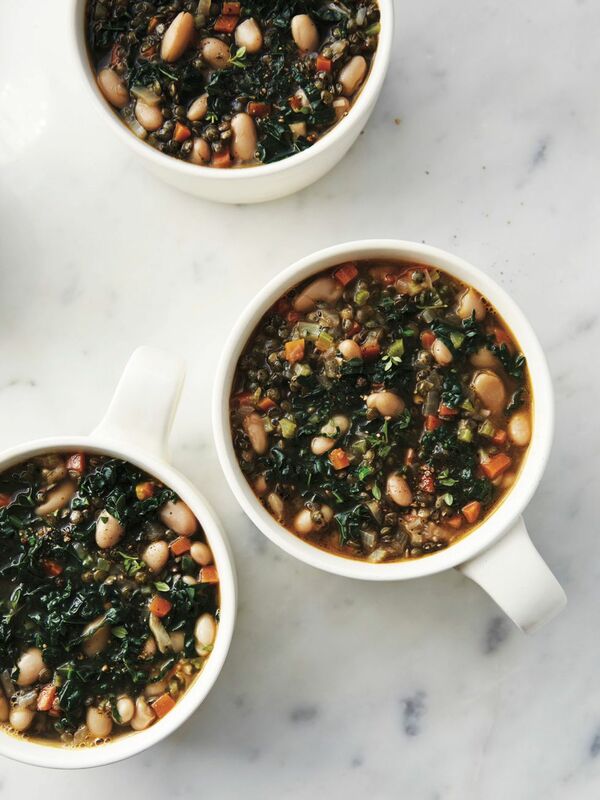 Cozy up with your favorite drink and this hearty stew. In a large, heavy-bottomed soup pot over medium heat, heat the oil. Add the onion, carrots, celery, and garlic and cook, stirring occasionally, until the vegetables are soft, about 10 minutes. Stir in the thyme, then add the lentils, salt, pepper, and vegetable broth; bring to a boil, stirring several times to prevent the lentils from clumping. Reduce the heat to low, cover the pot, and simmer until the lentils are cooked, 25 to 30 minutes The lentils will keep their shape but should be tender all the way through. Add the beans, kale, and vinegar. Simmer until the beans are heated through and the kale is tender, about 8 minutes. Remove the thyme and season to taste with more salt, pepper, and perhaps another splash of vinegar.